Photography in this day of iPhone snaps and YouTube video is such a part of the fabric of the world it is hard to imagine life without it. On a hike along the Pacific Crest trail or a caravan across the Sahara you might escape the daily drowning in images, commercial and otherwise, but otherwise, like a new species evolving, we learn to swim in them, the brain slowly adapting. Images of destruction and cruelty are available instantly. We no longer have to wait for the six o’clock news to see the war in our living rooms as during the American war in Vietnam, much less a week or so to see the newsreels from the front in WW II. One hundred years ago, as the Great War began, photography was technology in its bare beginnings. Although Kodak personal cameras had been in use since the last decade of the 19th century most newspapers and magazines still used line drawing and lithographs if any images were used at all. Not withstanding Mathew Brady’s powerful photographs from the American Civil War and Horace W Nichols in the Boer War, the initial projects by the British War Propaganda Bureau in 1914 all but ignored photography, concentrating on literature, poetry, stories and newspapers accounts. 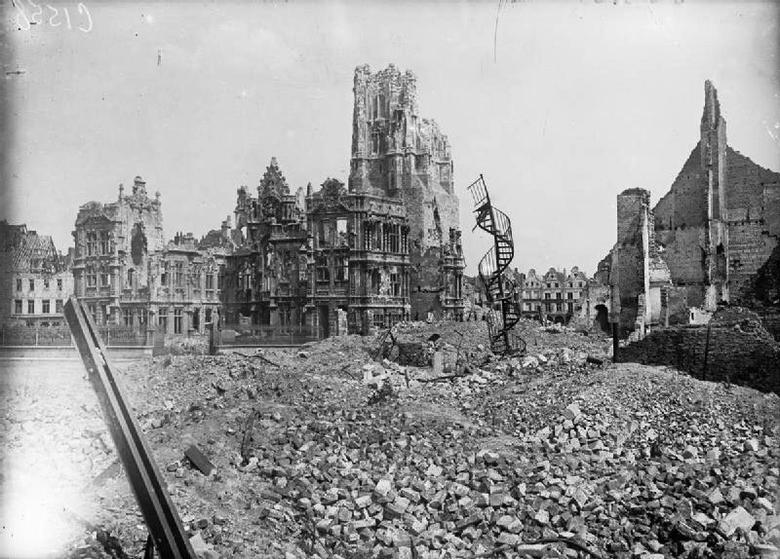 In August of 1914 all photography at the Western Front was banned, whether personal or professional. Soldiers, sailors and airmen on both sides ignored the order; eventually newspaper photographers were allowed at the front, and military units had their own, official, photographers. 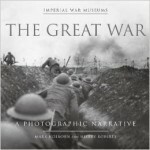 The result, 380 of which are gathered in a richly illustrated large-format book is The Great War: A Photographic Narrative. Editors Mark Holborn and Hilary Roberts culled through some half a million photos in the Imperial War Museum in London to present these, along with detailed timelines of the war, developments in mass media technology, and war photography itself. Though not having the close-up, or color advantages of modern photography, the classic black and white photos, some taken at a distance, of great crowds cheering the beginning of hostilities or ships on the horizon, some hand held by a soldier in retreat, of his fellows, or of others, miniscule on stacks of ammunition. Two of the most powerful, to my eye are of ships at sea. An “unknown German seaman” took a marvelous picture from the bridge of his ship, showing the wide foredeck surging through a wind-ripped sea. The ship directly ahead is rolling to port at a sharp angle, throwing side wash high and wide. Ahead of it, in the distance, are three more ships of the German East Asia Squadron, somewhere in the South Pacific, the end of November, 1914. The nausea of sea and death in battle both arise. 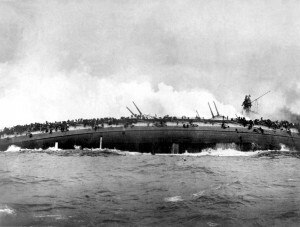 Joined with it, and even more powerful is the two page spread, again by an “unknown photographer” of the great German battle cruiser, SMS Blucher, rolling onto its side, hundreds of sailors clinging to it, before it goes down during the Battle of Dogger Banks, in the North Sea, 24, January, 1915. Slightly out of focus, water pouring down the sides, the men in gray and black bunches silhouetted by the smoke of the fires, and that against a dull gray sky turn this into an amazing record of destruction – of machines and of humans. 792 German sailors died on this one ship alone. One Rifleman R.W. Turner captured a group of six Germans and Brits during the famous Christmas truce of 1914, along the lines in Belgium. His and other such photos were published in England, convincing many that the event was not just a rumor. Shots of men to their knees in water filled trenches may be familiar to us from movies of the war but are more powerful for having been taken of real men in real time. 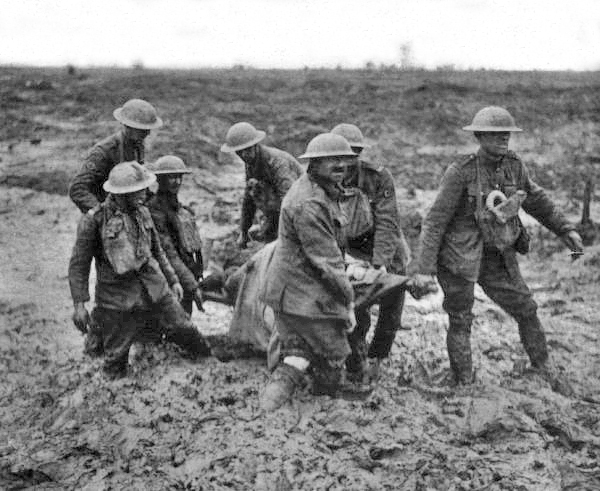 Some 240,000 British soldiers were casualties of “trench foot” from weeks and months in sogging, never dry, locations. 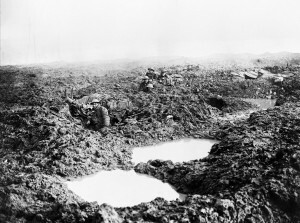 The measure of the toll of war is both intimate, in shots of wounded men, and enormous, in panoramas of entirely bomb ruined fields, with a few men holding water filled holes, or dead men, sprawled across the much they once defended. Among the surprising are shots of colonial troops, Cameroons and Senegalese in Africa, under German, French and British command, and a very powerful “walking into the camera” shot of wounded Baluchis (India), arms in slings, faces lean, dark and mustached with a young Belgian boy looking on; again, photographer unknown. 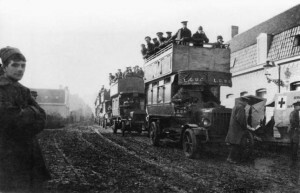 I had often heard of and seen pictures of the famous black Paris taxis taking reserves from Paris to the battle of the Marne but had no idea that transport was so scarce in the early months that regular London buses were shipped across the channel and used to get men to the lines. The effect of such photos, of any photos, is up for debate. As Susan Sontag pointed out, the Spanish Civil war photos which Virginia Woolf was sure would end the war if enough people saw them, and felt the horror of what they showed, were used by both sides as propaganda, urging more weapons to help kill more of the perfidious enemy. So this book, as thoughtfully arranged and selected as it is, runs the risk of simply being a coffee table journey into nostalgia (for something we ourselves never experienced.) It raises the question sometimes raised about Sebastain Salgado’s enormous breath-stopping photos of human work, flight and misery: does the technology and the trained eye turn the terrible into a kind of mesmerizing beauty or testimony to human courage instead of folly? Since many of the Imperial War Museum photos are clearly amateur, clearly taken with crude equipment and under severe circumstances, the question of beauty doesn’t often arise. Though perhaps one as fundamental does: if it can be captured, frozen, held, is it, was it, alive, was it dreadful? Can the truly dreadful ever be captured, taken in, except by those in the first person? Does the attempt to do so, create a false sense of knowing, and comfort to those of us who were not there, and think, vicariously, we share with those who were? It is possible that such photographs will have an effect opposite of that intended. For me, not. A slow viewing of the pictures, pages closed after a dozen and re-opened later, adds mass and distribution to what I have learned about the war through reading, from young happy faces early, to corpses, unattended, later; from aerial shots of gas drifting over road-seamed farmland to enormous battleships going down. Diminutive women in explosives factories — called munitionettes– sustained injury and death in accidental explosions. Camels raced, horses struggled with heavy canon through sucking mud, dogs and pigeons were used to carry messages. It is common worldwide to put photographs of images of those we love and admire in our homes, to be reminded of them, to turn our thoughts to what they represent. I wonder, if our cultures required us, instead of Christ or Mary, the Buddha or verses from the Koran, Kennedy or King, Mandela or El Presidente on our dining room or bedroom wall to be reminded daily of, say, the stretcher bearers at Passchendaele, would we be any more hesitant to urge another war to end a war?